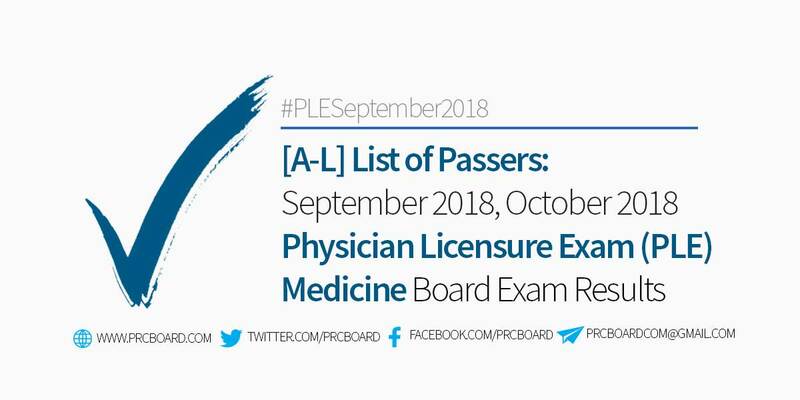 MANILA, Philippines - The official results, list of passers, top examinees, performance of schools and other important announcements for September-October 2018 Physician Licensure Exam (PLE) are released by the Professional Regulation Commission (PRC) Board of Medicine five (5) working days after the board exams. Below is the list of passers for September 2018 and October 2018 PLE with surnames starting with letters A-L. Physician Licensure Exam or PLE is one of the board exams with average number of examinees administered by PRC. PLE is scheduled twice a year to cater the growing number of aspiring professional teachers. For 2018, PLE are scheduled on March 2018 and September 2018. The board exams are administered by the Board of Medicine headed by its Chairman, Dr. Eleanor J. Galvez at PRC testing locations around the country specifically in Manila, Baguio, Cebu and Davao. Below is the summary of exam results in the last five (5) years, courtesy of PRC. To receive updates on any announcements about September 2018, October 2018 PLE board exam results, we advise our readers to bookmark this page, visit PRC official website, follow us at our social media pages via Facebook and Twitter or join the members discussions at our Facebook Group. Anong taon kaya lalabas ito? sorry for the delay we are doing our best to provide the result immediately dont worry i know you failed. why sobrang taga!do you even consider those doctors who are going to report for duty? This delay should be explained! Exams rescheduled more that one month and now this? it is getting on my nerve!!!! kailan po matatapos ang mahaaaaabang paghihintay naming lahat? I cannot by the progress of the stars. Give guess how near to day. PRC PINAPATAY NIYO KAMI SA KABA. GALAW GALAW NAMAN DIYAN O.
PRC, Nice one ang Tagal po. delayed kasi may bagyo? Ooh dear how much longer? PINOY TALAGA MGA NASA PRC. FILIPINO TIME. NAKAKAINIS NA. ANONG NANGYARI SA 3 DAYS LANG MAY RESULT NA?? Hindi pa rin po ba lalabas resulta ngayon?para naman po makatulog nmn kmi at hindi lage nagrerefresh sa page nato. Matagal ba himasin ang result? Unbelievable! Ang tagal naman po ng release ng result of exam. Sana man lang may public advisory kayo kung ano ang nangyayari at bakit delay ang update. Stress na ako ang tagal tagal last week pa ako nagrerefresh! Gagawin Top 10 mga taga Davao. Way ayo PRC, sama sa atong presidente. Antagal! Sabi niyo 3-4 days lang, panglimang araw na wala pa rin!